Well folks, it appears as though blankets rule the runway. That's right, blanket coats are to be the go-to outerwear pieces for the upcoming Fall/Winter season. 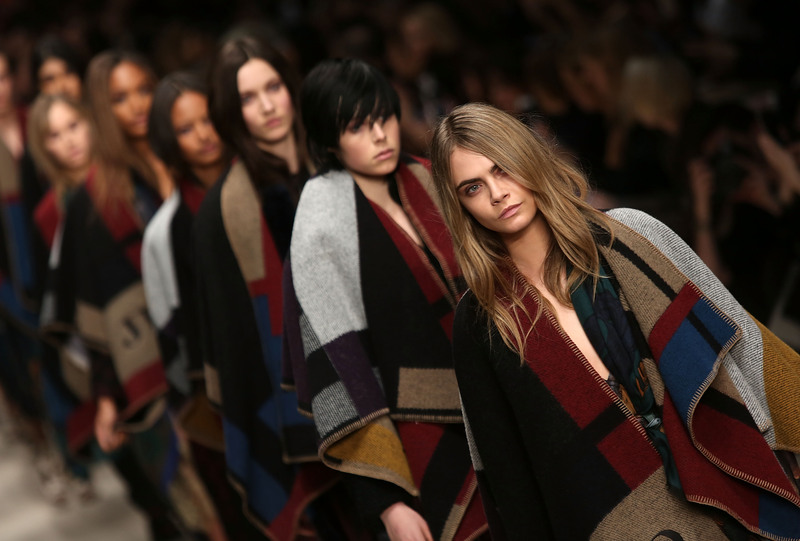 Burberry's Fall show featured the one-and-only Cara Delevingne rocking a monogrammed version of the company's Check Wool and Cashmere Blanket Poncho. Did she make me want my very own? Yeah, okay maybe just a little bit. But she could probably sell potato sacks, so I'm not trusting anything Ms. Delevingne wears. So I had to step back and think. When it comes to fashion, I can be pretty lazy, so at first this trend was warmly welcomed. I envisioned myself in yoga pants, an oversized tee, bunny slippers, and my favorite old fleece throw, skipping off to the mall or wherever I damn-well-pleased because, hey, this outfit is en vogue now! But then I realized that probably the only way the blanket-coat trend would work as actual outerwear is paired with dressier pieces. Otherwise, at best, it's just pajama-chic. This one from Isabel Marant unfortunately just looks kind of like an old bathrobe a la Johnny Depp in Secret Window. I appreciate that this one from Chloé has a little more structure, but it still kind of reminds me of those vests you have to wear at the dentist when they X-ray your teeth. I actually like this one from Stella McCartney because I think it better captures the relaxed vibe I get from the idea of blanket-coats. However, I still don't see this as an investment piece. There might be some promise for this trend, but I think it's just that — a trend. It won't last long enough for me to justify participating in any way other than wearing the blankets I already own around the house. I don't see blanket coats being added to the vault alongside Burberry's immortalized trench coat anytime soon.